Is it April? It feels more like January, but hopefully, that will change soon. Despite the cool and wet weather, the cherry trees are starting to blossom and that is a sure sign that the bait and chinook will start to show up off the Hump and in and around the south Bowen area. 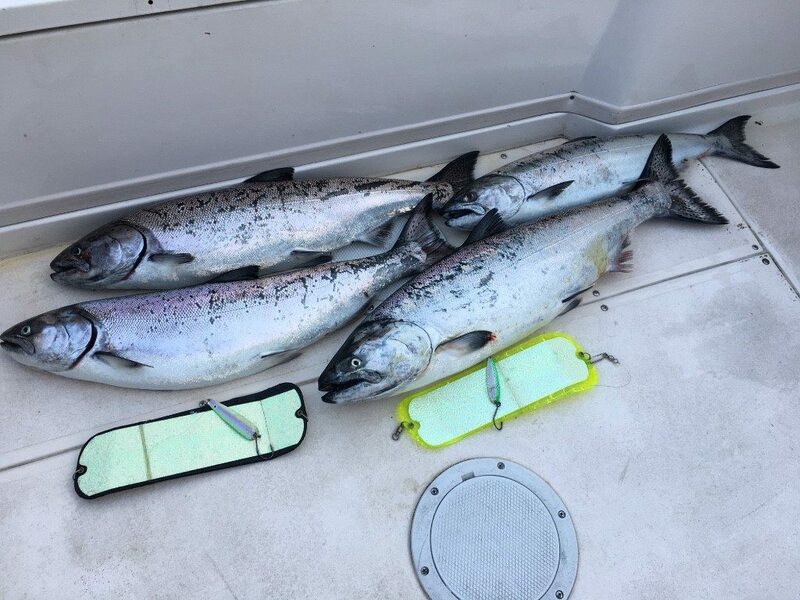 Right on queue, we have encountered fish in both areas this past week, as well as fish up Howe Sound and right in Vancouver Harbour around the Bell and Mile Markers. 2 nice chinook from Thursday. One was caught around Bowen, the other off the Mile Markers. I know I am going to get some emails about where the Hump is, so let me tell you. Take a chart, and head SW off Bowen Island around 3 to 3.5 nautical miles. You will see on your chart a large area, like a jellybean that has contour lines in the 400 foot to 500 foot zone. I am not sure why we call it the Hump, it is more a tabletop and it is a huge spot, about 3 miles long and a 1.5 miles wide. If you head out there this weekend, winds permitting, you will see some boats fishing there. Good depths to try on your riggers are usually in the 90-120 zone. Deeper if the water is really clear and it is sunny out, shallower if the water is dirty and it is a dark and cloudy day. Productive setups this week have been glow flashers and spoons, so not much change there. A flasher that has reflective tape on one side and glow on the other will get the job done. Some of our favorites are the Blue Footloose, Green Footloose, Salty Dawg, and good old Chartreuse blade with glow on one side and silver tape on the other. A 5 to 6 foot leader with a spoon that is 2.5 to 3.5 in size with some glow on it and colours of green, blue, or black, will also work well. This past week the Pesca Forage was good and so was the 3.5 Kingfisher. For the most part the bait has been on the bottom and so have the fish, but we are getting few fish suspended as well. Most of our fish this week came from bouncing bottom, as that is where the bait has been, see the picture above, but we are starting to pick up a few fish a little higher up in the water column. Try running one rigger with 1 rod on it just off bottom and the other rigger close to bottom with 2 rods with a big spread so you can cover some more water. We will have to wait and see if the anchovies come up shallow and we get the same shallow fishery as we enjoyed last spring. So where should you go this weekend? That is a tough call and it might be decided by the winds. There are fish in the harbour, at the QA, at the Hump, and in Howe Sound. Might be a harbour weekend if this gale force SE 30-40 actually shows up. Either way, we will be out there this weekend, so good luck to you and enjoy the spring fishing.